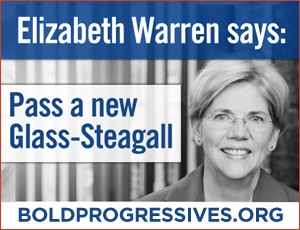 Watch Elizabeth Warren fight for her new Glass-Steagall Wall Street reform bill on CNBC and sign the petition. But watching this video and saying, "Yeah!!" is not enough. Warren needs you to join the fight. She says: "I want to thank all my friends at the Progressive Change Campaign Committee. We've got a lot of work to do together. I know when you're here as partners, we can do this." Sign the petition on the right. It's time for Congress to put Wall Street reform back on the agenda. We support passing a new Glass-Steagall law to prevent too-big-to-fail Wall Street banks from taking huge risks with people's life savings -- and then expecting taxpayer bailouts.